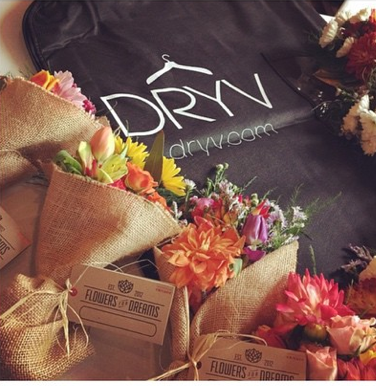 My New Favorite App: DRYV – Tri. Tech. Travel. Not sure about you, but working in the hospitality there’s one bill that gets a tad annoying from time to time – dry cleaning. It’s a never-ending chore, especially if you live in an area without dry cleaning nearby. It’s never fun, I always put it off for as long as possible, which is never a good idea in itself. That is, until the day I found out about DRYV. I found them on twitter after a friend retweeted a contest to win a $25 credit, which I ended up winning (Woo!!). I was pumped to try them out after reading about what this laundry & dry cleaning service that comes TO YOU is all about. Not only do you download an app to schedule the timeframe you’d like them to pick up your clothes & then deliver them a day or two later, you aren’t paying EXTRA for this on-demand dry cleaning service that comes TO YOU. Did I mention you don’t have to leave your home? It’s amazing. And affordable. The day I tried this service out, they came right on time, I also received up to date alerts, similar to Uber, that they’re “now arriving” so you’re ready with your clothes, AND they’ve been running all sorts of fun promotions lately, so when my clean clothes were delivered a day later and I checked what time I’d like them to arrive, I received some lovely flowers from Flowers for Dreams! All in all, great experience, my favorite new (free) app & service to try out!